If this behaviour can be observed in real life – and we stress that our model is only theoretical – it would have unintended micro- and macroprudential consequences. From a microprudential perspective this means that a stricter capital requirement would have the same increase in safety and soundness, but with less of a retreat in lending than anticipated. This would lower the cost of the policy. From a macroprudential perspective, it means that a policy that may have been designed to dampen the mortgage market may fuel it (and in fact, dampen other seemingly unrelated markets). The law of demand states that if something becomes more expensive, people should consume less of it. Goods that violate the law of demand are called ‘Giffen goods’. The standard example of a Giffen good is potatoes during the Irish famine. As the price of potatoes went up, Irish farmers had to cut back on expensive foods and instead bought more potatoes (while the Irish famine example is apocryphal, Jensen and Miller (2007) found evidence for this behaviour for rice). Why would this behaviour arise? In economics terms, it can be explained by the presence of a constraint in addition to the amount of money available (the budget constraint). This follows the set-up used by Gilley and Karels (1991), shown in Chart 1. In addition to the usual budget constraint of demand theory there is a subsistence constraint. 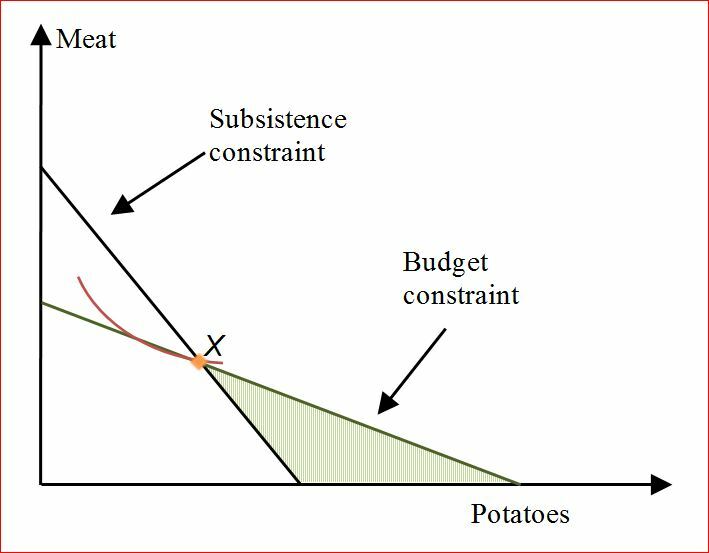 The consumer cannot fall below it but he also cannot be above the budget constraint, which makes the blue shaded area the set of possible consumption bundles. At any given price, potatoes offer more calories than meat – for example, at current prices a kilogramme of potatoes might cost as little as 50 pence, yielding roughly 1000 kilocalories. Buying 50 pence worth of meat will result in a considerably lower calorie intake. It follows that a poor man is likely to satisfy his dietary requirements largely with potatoes, supplemented by some meat. 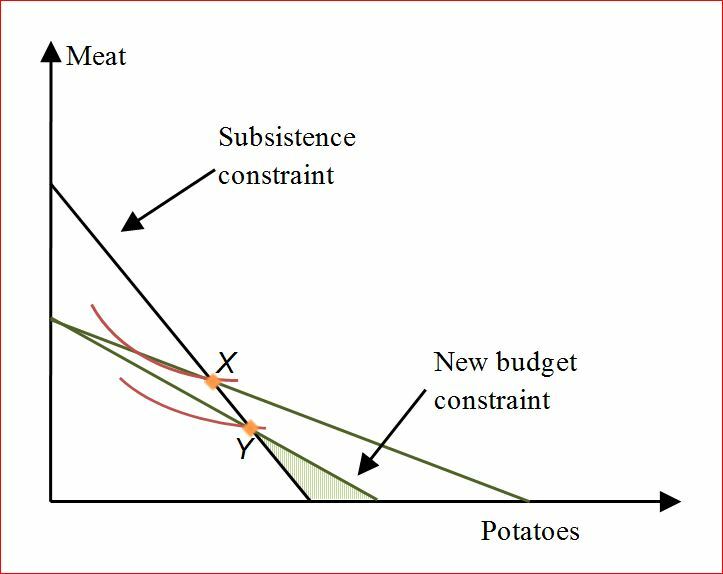 For Giffen behaviour to occur we must assume that the subsistence constraint is binding, ie the consumer would rather consume more meat but cannot because of the subsistence constraint. Graphically, it means that the consumption bundle is where the subsistence and the budget constraints intersect. This is point in Chart 1. If the price of potatoes increases he can no longer afford his original diet. But reducing his consumption of potatoes is not an option because this menu would leave him below his daily calorific needs – even if he spends any extra money on meat. So he must cut back on meat and eat more potatoes, despite the price increase of the latter. He moves from point X to point Y in Chart 2. We relate this insight to a simple model of bank behaviour. The central premise of the model is to think of banks in the context of classical demand theory and consider them as ‘consumers’ of financial contracts promising repayments (eg loans). This is counterintuitive since we usually talk of banks ‘selling’ loans, but consider getting a mortgage: the bank effectively buys a promise of repayment with interest from the customer in exchange for cash. This is not conceptually different from companies buying equipment, or households buying goods. Under this premise, our model considers a risk-averse bank which maximises its expected utility. Expected utility increases with the return on equity, and decreases with the volatility of returns, subject to a given amount of capital (capital is akin to wealth in consumer theory). We use a constant absolute risk aversion utility function, which implies rational preferences and standard convex indifference curves. The bank chooses its allocation between two assets: one has a low expected return and low volatility (say, mortgages); the other has a high expected return and high volatility (say, loans to small and medium-sized companies (SMEs)). ‘Prices’ in the model are given by capital requirements determined exogenously by the regulator for each asset. If capital requirements are high, a bank has to ‘spend’ more capital to acquire an asset. The bank is subject to two constraints: a risk-weighted constraint where the higher-risk asset has a higher capital requirement than the safer asset; and a leverage constraint, where both assets have the same capital requirement. This set-up can be represented in a similar way to the potato-meat model above. Chart 3 shows the set-up without a leverage constraint. The bank’s preferences are such that it would like to mostly invest in mortgages, at point A. Chart 4 adds the leverage constraint, which prevents banks from holding more than a given amount of assets relative to its capital – it chops off a section of the budget set, making the initial portfolio A unfeasible. The optimal portfolio is now portfolio B, which consists of fewer mortgages than the bank would like to hold in the absence of the leverage ratio. Chart 5 illustrates how Giffen behaviour can arise in this model. If we increase the capital requirement on mortgages, we limit the budget constraint further as seen by the pivoting of the risk-weighted constraint. In our model – with perfectly rational preferences – the bank increases its holding of mortgages and moves to point C.
This is the Giffen effect. And it is utterly counterintuitive. 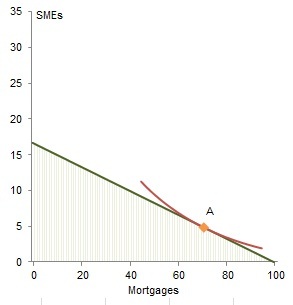 According to the law of demand this ‘price increase’ should reduce the bank’s demand for mortgages; the bank should have decreased its holding of mortgages and increased its SME loans (note that if we keep increasing the capital requirement on mortgages the Giffen effect will eventually stop and the bank will respond to the increase in price by holding fewer mortgages). The key factor for this to occur is that the bank is constrained by the leverage ratio: in its absence the bank would hold more mortgages. How can we translate the economics to the real world? We need a bank – or building society – that really likes mortgages and is prevented from holding as many as it would otherwise want to by the leverage ratio. The firm might have this preference because of its business model. Building societies, for example, are required to hold at least 75% of their balance sheets in mortgages. Some ring-fenced banks, too, might largely hold mortgages, depending on the design of the ring-fence, since that is the predominant retail asset class. At point B the capital requirement (‘price’) of mortgages under the risk-weighted constraint is much lower than under the leverage constraint. 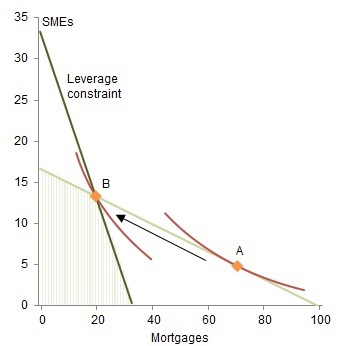 But since the leverage constraint is the binding (and therefore the relevant) constraint, investing in mortgages is relatively inefficient (in the language of the FPC’s leverage review, the risk weight on mortgages is much lower than the ‘critical average risk weight’ implied by the leverage ratio). This inefficiency counteracts the bank’s preference for mortgages. When the risk weight on mortgages increases the wedge between the risk-weighted and leverage constraints becomes smaller, and investing in mortgages is less inefficient. The bank’s reaction is to invest more in mortgages. Another way to explain the behaviour is to note that due to the leverage constraint, the bank is holding more SME loans than it would like to even before the change in capital requirements. Because of this it may not feel comfortable to reduce its relative exposure to mortgages even further and may react to an increase in capital requirements on mortgages by decreasing its exposure to SMEs instead. In other words, the bank may react to an increase in capital requirements on mortgages, which are its core business, by cutting back on non-core business such as SME loans. If this behaviour is not confined to theory it can have considerable policy implications. From a microprudential perspective it would mean that greater resilience can be achieved at a smaller cost to the macroeconomy because lending decreases by less. From a macroprudential perspective it would mean that policies such as sectoral capital requirements may not always result in a countercyclical contraction or expansion of credit. Renzo Corrias works in the Bank’s PPD Banking Policy Division and Tobias Neumann works in the Bank’s PPD Policy Strategy and Implementation Division. Previous Post Drivers of long-term global interest rates – can changes in desired savings and investment explain the fall? Next Post UK mortgage rates: born in the USA?